We all know what email marketing is; the ability to communicate to an unlimited audience via an electronic message. We all send emails each and every day, for business and for personal. A report by Radicati Group estimated that around 205 billion emails were sent each day. To break down the figure further this works out at 2.4 million emails per second, and 74 trillion per year. A figure that is only set to increase year on year. Of course, once you’ve sent your electronic communication you have no control over how many of your contacts open, read and click through to your email assets. So what can you do to minimise unsubscribes and keep your audience engaged? Your subject line should give a clue as to the content of the email. After all, if you received an email that gave no indication of the topic would you open it or just click spam? Many email software systems include subject line checkers – if yours does it’s worth making use of it. Think about the emails you have opened recently, what attracted you to them? It’s also important that your brand or company name features within the initial email. Choose a suitable email address for replies, one that your audience will recognise, again if your email address is not recognisable you run the risk of your communication being regarded as spam. Okay, so your subject heading can make or break your open rates but how do you engage your audience once they’ve opened your email? Use an informative and accessible asset lead. An asset lead is a feature and inclusion within your email that encourages your audience to find out more. Examples of asset leads include a link to view a video, a link to a specific landing page or even links to your social media pages. It’s important to include a call to action in every communication you have with your audience, whilst a call to action can be as simple as ‘call us now for more information’ they also include taking an action such as clicking through on an asset lead. Asset leads are valuable tools in ensuring engagement. Most email and web systems will provide management information on the number of click-throughs and in particular, who and when the asset was viewed. This information can provide vital intelligence to your follow-up processes. Your company, your brand, your way! It’s important to establish your brand and stick to it. A brand is much more than just your logo, your corporate colours or the style of your business cards. Your brand is the words you choose to use, the style of your writing, the images and layout of your communications, even the font you choose to use. These variables form your brand. This is your chance to promote your company personality. A friendly, informative and knowledgeable, well laid out brand is more likely to attract, retain and engage with its audience. If you took away the logo from your headed paper, would you recognise your own branding and style? More importantly would your consumers? Your database is an integral part of your business, an important asset. If you have a long standing business it will have taken you many years to build up your database. If you have a relatively new business it’s equally important to retain and build on the data you have acquired. Either way your data is precious! That’s why data segmentation is important. Data segmentation is the process of identifying groups or segments within an existing database and separating your audience so that you are able to target them with specific and relevant communications. Segmenting your database will ensure your marketing is more focused. You can target groups with specific communications that you know will be relevant and offers that will be of interest. Avoiding generic, ‘round robin’ communications reduces the amount of time you spend on unnecessary follow-ups. Generic campaigns are also more likely to result in unsubscribes and a disconnection with your audience. Segmentation will make your communications more personal. A more specific and targeted offering helps your audience to feel more engaged with your brand. Your contacts will feel that you really know and understand their business and requirements. Data segmentation needs to be the starting point of any marketing campaign. When it comes to email marketing less really can be more. Quality is much more important than quantity. Offers and announcements, very much like exclamation marks should not be overdone! This is where your data segmentation is important. Focus on what matters and is relevant to your audience. Delivering high quality content is the most important part of your email communications. If all of this sounds like hard work, it’s worth bearing in mind that email marketing is one of the least expensive and cost effective forms of marketing. Preparation is key and getting it right will reap rewards for your business. 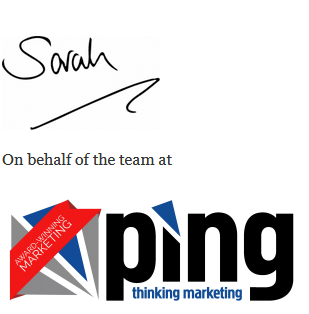 For more information about email marketing please call us on 0330 041 4550 or email hello@pingmarketing.co.uk.